Our 5' x 5' x 20' Gray way grinder enables us to grind machine component ways straight and parallel within .0001 per foot. This degree of accuracy cannot be achieved by the use of straight edges and hand scraping. Our rebuilding procedure is to grind the most rigid casting and then hand scrape its mating component to fit providing the proper number of bearing points per square inch. Here we are grinding a 21" Colchester lathe bed. The casting is first rough ground and then allowed to cool for a number of hours in order for it to stabilize from the heat generated. 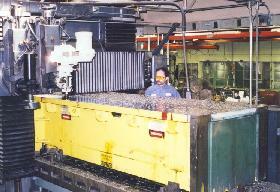 When finish grinding we remove not more than .0001 per pass while flooding the casting with coolant. 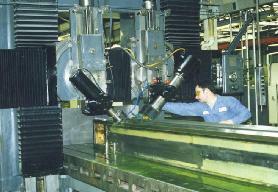 After completion we again allow the casting to stabilize and then indicate all the ways. If any are out of tolerance they are then re-ground and inspected again. 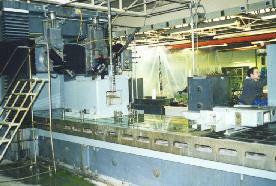 To the left you see the base and saddle of a 10" x 24" Gallmeyer & Livingston surface grinder. We are grinding both pieces in one set-up in order to match the respective way angles more precisely. Afterwards, the saddle will be hand scraped to mate with the base since it is the more rigid casting. In addition to way grinding our Gray can function as a planer mill with the removal of a grinding spindle and the addition of a milling head. Here you see a 17,000 lb. 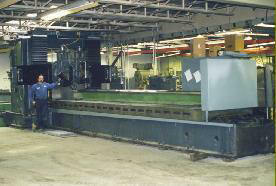 ram from a Dreis & Krump Chicago straight side press being machined flat after becoming bowed from usage over the years. The surface area to be machined measured 4' x 12' and was held flat within .003 overall.